The government has confirmed a skeleton that could be that of Richard III will be interred in Leicester if it is confirmed as the 15th Century king. The bones were found in September by archaeologists digging beneath a car park in Leicester. Leicester, Nottinghamshire and York MPs discussed a permanent grave on Friday. In a written answer, justice minister Helen Grant said the skeleton would be interred at Leicester Cathedral if tests proved it was Richard III. In response to a question posed by Dan Jarvis, Labour MP for Barnsley, Ms Grant wrote: "My Department issued a licence to exhume human remains which could be those of Richard III. "Remains have now been exhumed and archaeologists are currently carrying out tests to determine the identity of the remains. "Should they be found to be those of Richard III, the current plan is for them to be reinterred in Leicester Cathedral." Listen: Did the Wars of the Roses lead to the birth of the modern age? DNA results on the bones are being compared to that of living descendants of Richard's eldest sister, Anne of York. Richard died at the hands of forces of Henry Tudor near Market Bosworth, Leicestershire. His grave, in the church of Greyfriars in Leicester, was lost during centuries of redevelopment. However, the archaeologists from Leicester University have found a skeleton, which is consistent with the known details of his appearance and death. A university spokesperson said the evidence included signs of a peri-mortem (near-death) trauma to the skull and a barbed iron arrow head in the area of the spine. Richard is recorded by some sources as having been pulled from his horse and killed with a blow to the head. The skeleton also showed evidence of severe scoliosis - a curvature of the spine - which may have led Shakespeare to portray him as a "hunchback" king. Campaigners from both York and Leicester have said the remains, should they prove to be the king, ought to come to them. In the debate, Labour MP John Mann, from Bassetlaw in Nottinghamshire, offered Worksop as a halfway point between the two. Labour's Jon Ashworth, who represents Leicester South, said in response to Ms Grant's written answer: "This is terrific news and a victory for the campaign. "I always strongly argued that Leicester Cathedral was the most suitable final resting place for the remains of Richard III. Fingers crossed it actually is him now!" Joe Ann Ricca, founder and chief executive of The Richard III Foundation, which had argued the skeleton should be interred in York, said she was disappointed at the decision. "If his remains are really going to be buried in Leicester, we would hope he at least has a traditional Christian service," she said. "But it's kind of a monstrous act when you know that the former king of England had expressed the desire and a wish to be buried at York Minster." 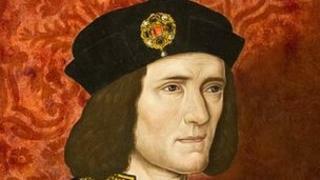 Richard III dig: Have they found their man in Leicester?